Manxman Molyneux has recruited Benjamin Binns as his Sidecar passenger and the pairing will compete on the same 600cc DMR Kawasaki that provided ‘Moly’ with his 17th TT victory a month ago. 'Dave Moly’ as he is popularly known won his first Sidecar Championship in 1986 with Paul Kneale in the chair. Dave won the coveted title again, three years in a row in 1991, 1992 and 1993. It was to be another five years before he would be crowned ‘champion’ again in 1998, then 1999 and 2000 conspired to keep his hands off the trophy. With no races in 2001, the man from Regaby returned with Craig Hallam as his ballast in 2002 and regained the championship title, which the pair retained in 2003, before he set off for pastures new. 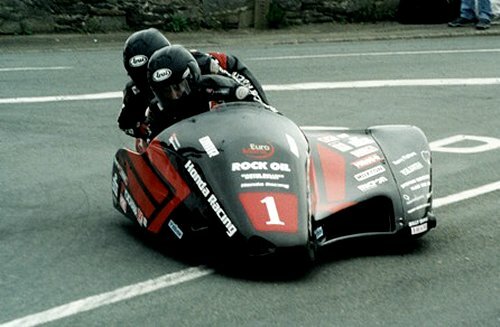 To date Dave Molyneux has won a total of 15 Sidecar races at the Southern 100, including the seven championship titles. Dave will be in familiar surroundings, as his fellow TT winning rivals, Tim Reeves, Conrad Harrison, Ian Bell, John Holden and Roy Hanks line-up on Castletown Bypass to challenge for the title of Manx Gas Southern 100 Sidecar Champion, with no quarter given or asked.